Not that long ago, comparing a Subaru BRZ to a Ford Mustang would be unthinkable. But the latest Mustang actually has a great deal in common with the BRZ, if you think about it. Both cars are available with a four cylinder engine, a six-speed manual transmission, and an independent rear suspension, plus both cars start at exactly $25,395. Looking at it that way, it’s a genuine apples to apples comparison. 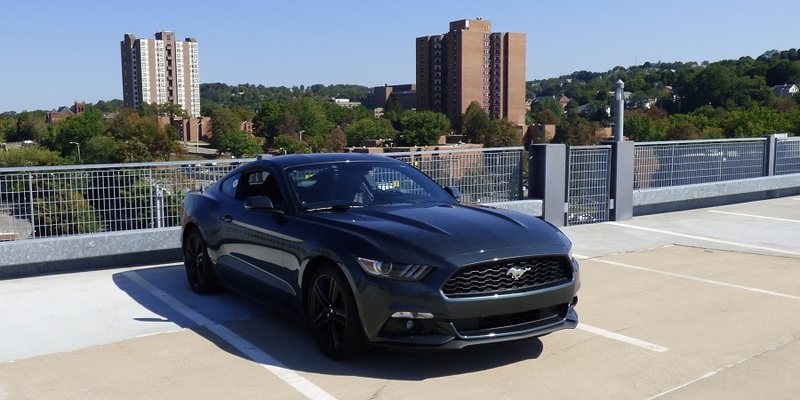 The Mustang that Ford loaned me for Black River Stages was fully loaded, with the EcoBoost Performance Package, leather Recaro seats, MyFordTouch, and all the bells and whistles Ford could throw at it, pushing its sticker price up to a whopping $38,585. That’s more than a Mustang GT, which starts at $32,395. It’s also a completely unfair comparison to my own BRZ Premium, which has no additional factory options. Better equipped BRZs than mine get options like push button start, leather seats, and automatic climate control, which the Mustang has. But other options like adaptive cruise control, blind spot monitoring, and backup cameras aren’t even available on the BRZ. For the sake of this comparison, I’m considering the options the BRZ could have that mine doesn’t, and ignoring the features of the Mustang that aren’t available for the BRZ, and/or push the price out of BRZ territory. Of course, there are some very obvious differences. Let’s get those out of the way first. Power. The Mustang has it. This is due to something else the BRZ doesn’t have – a turbo, boosting power to 310hp and 320lb/ft of torque. It’s amazing – just five years ago, the Mustang GT with the 4.6 V8 was making that kind of power, and now we get it out of an engine half the size, both in cylinder count and displacement. The BRZ is often criticized for its lack of power, and though I don’t think it really needs more, its 200hp and 151lb/ft of torque can’t measure up to Ford’s EcoBoost 2.3. Also, where the BRZ falls flat with its infamous torque dip at mid-range RPMs, the Mustang makes maximum torque starting at 2500 RPM and continuing through most of its rev range. 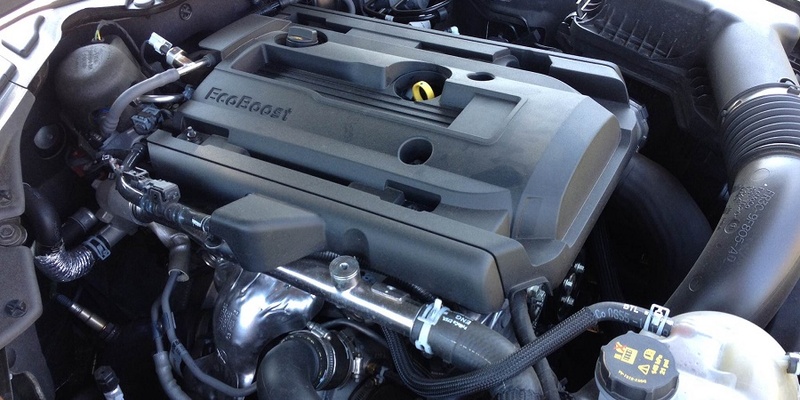 Not only is the Mustang EcoBoost more powerful, the power is more usable in everyday driving. The Mustang is also a big car compared to the BRZ. It’s 22″ longer, 5″ wider, and 768lbs heavier (though still around 200lbs lighter than the GT thanks to its smaller engine). But that leads to more room inside for all four seating positions. Not that you can really fit adults comfortably in the back seat of either car, but some of the Mustang’s extra length is between the front and rear seats, so your legs have somewhere to go, unlike the BRZ. Unfortunately, the Mustang’s roof slopes down even more than the BRZ. At six feet tall, I had to tilt my head quite far to the side just to get into the back seat, and would be quite uncomfortable riding back there for any distance, not matter how short. But still, if you have to choose between having your legs cut off to fit in the BRZ, or your head cut off to fit in the Mustang, I figure you can live without your legs, but not your head, so the advantage goes to the BRZ. Not that you buy either of these cars for a spacious back seat, of course. 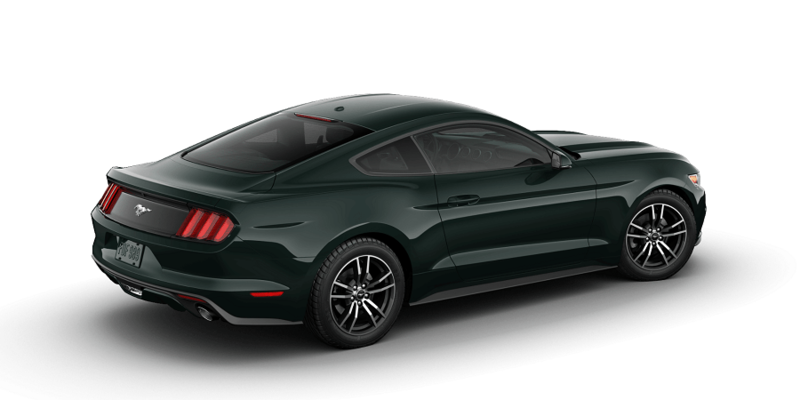 Still, the extra room inside the Mustang’s trunk and passenger compartment doesn’t feel like as much as its nearly two feet of extra length should give you. Some of that is because the long hood is designed to contain a V8, whether it needs to or not, and to retain the classic styling of the Mustang. The BRZ, though smaller both inside and out, is more honest about its dimensions, and therefore is easier to place where you want it on the road or track. Though in fairness, I didn’t have any trouble staying in my lane on some of the narrow back roads I commute on in the Mustang, unlike my ex-cop Crown Victoria which simply didn’t fit on those roads. After driving the Mustang for a couple of days I got used to its size, and it didn’t seem big to me anymore. With a few notable exceptions, Mustangs have never been known for their outstanding handling. This is where the BRZ shines. Every time I go to the track much more powerful cars will pass me, including Mustangs, but I’ll hang right with them in the corners and sometimes even be faster. The Mustang has three steering modes, but even Sport mode doesn’t come near the BRZ as far as steering feedback and responsiveness. The Mustang is quite good, but in the same way it trounces the BRZ in acceleration, the BRZ easily wins the handling contest. 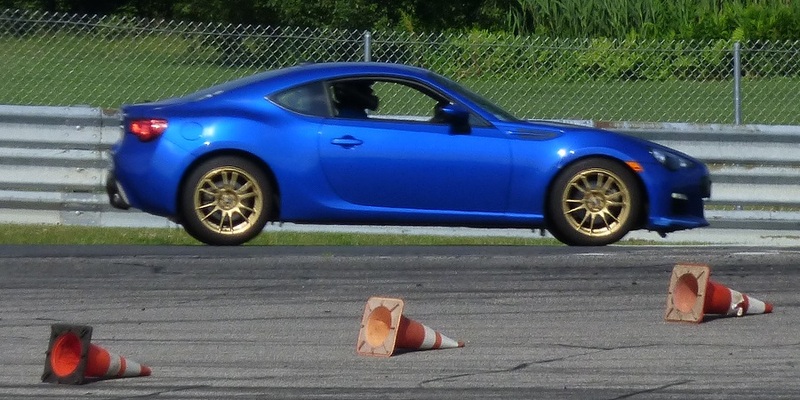 But let’s be honest – the BRZ was made to handle, and will win pretty much any handling contest this side of a Miata or Lotus Elise. The big news for the latest Mustang is an independent rear suspension, and this pony can still turn rather well. You can still feel its weight, but it’s well controlled, and body roll is minimal. It will never be as light on its feet as a BRZ, but it’s still very good, setting a much higher standard for Mustang handling capability and ride quality. The Mustang also feels more refined than the BRZ. A common complaint about the BRZ is its cheap looking and feeling interior. The Mustang puts it to shame in that department. 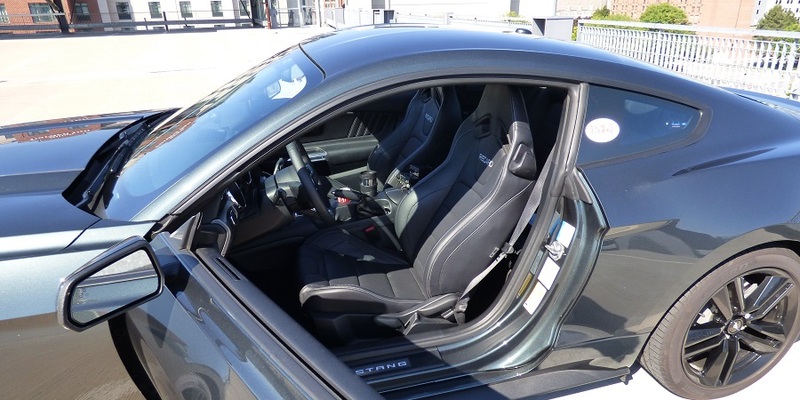 The BRZ’s interior never bothered me before, but after driving the Mustang for a week and getting back into the BRZ, it felt a bit lacking in quality and materials. The Mustang feels more solid, and the interior just looks nicer and more expensive. The ride quality of the Mustang is also much better, soaking up the bumps of broken Massachusetts pavement better than the BRZ. It’s quieter and more comfortable on the highway, though you may not notice your speed increasing to pull-me-over levels as much as you might in the BRZ. I’ve never complained about the BRZ’s brakes before. They’re good, and have no trouble hauling the car down to a stop, even on a technical road course. But again, despite the extra weight, the Mustang just felt better and inspired more confidence. Maybe it was because of the four-piston front calipers of the Performance Package. The BRZ is a new car. Introduced for the 2013 model year, it has no history behind it. Though it was certainly inspired by the AE86 chassis Toyotas, it is its own unique entity, particularly with the blending of Toyota and Subaru technology whether you drive a BRZ or a Scion FR-S (or Toyota GT86 in the rest of the world). The Mustang, on the other hand, has a long history and strong tradtions. I’ve never really been a Mustang guy, but even to me it seems that the latest version of the Mustang is leaving a good deal of its tradition behind. Though thoroughly modernized, the styling is unmistakably Mustang, and I really enjoy the the blend of the old and new. 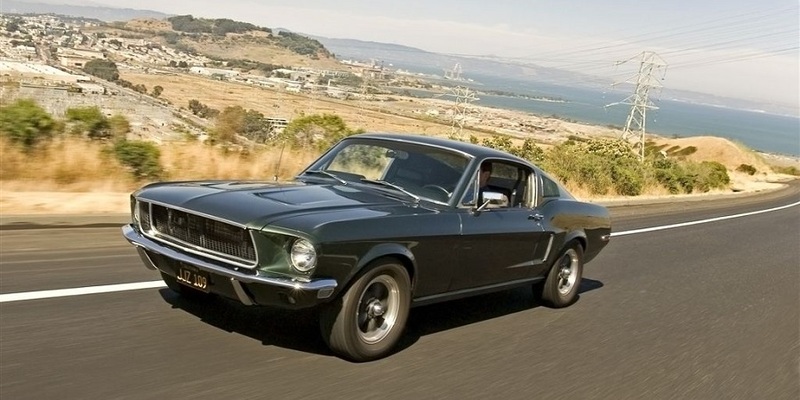 When I first saw my test car, I tweeted that I was going to feel like Steve McQueen driving it, since his Mustang in Bullitt was a similar shade of green. But I was wrong. At no point did I feel like chasing down a black Dodge Charger. It felt nothing like the 2005 GT convertible drove a few times at autocrosses, and that car did make me feel like Steve McQueen. But the new Mustang is a completely different beast. Some long time Mustang fans don’t consider it a true Mustang at all, since it’s such a departure from the past. (I’m looking forward to Will’s opinion of the Mustang GT he’s driving right now, since he is a long time Mustang fan.) At Black River Stages, one of the many people who talked to me about the car said they thought Ford had turned the Mustang into an updated BMW E36 M3. I disagree – in size, power, and performance, I think the Mustang EcoBoost is closer to an E46 M3. That’s quite a compliment, especially considering that the EcoBoost is the fuel sipper of the Mustang range. Despite its performance, I also managed to get over 31 MPG on the way home from Black River Stages, slightly beating its EPA highway rating. 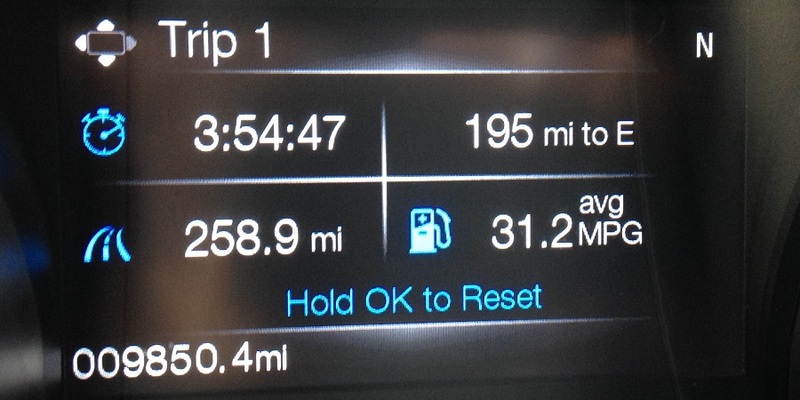 I’ve never reached my BRZ’s highway rating of 30, managing only 27 MPG or so. But the BRZ’s mileage is more consistent in mixed driving, particularly my back roads commute, while the Mustang dropped to the low 20s there. It’s hard to choose between these two cars because they’re so different. But despite all I’ve written about how much I enjoy my BRZ, if I was in the market for a sporty two door coupe right now, I’d probably go for a Mustang EcoBoost Premium. It costs more than a BRZ Limited, but includes many features you can’t get in a BRZ for not a lot more money. I’d splurge for the black wheels and an actual spare tire, but I’d actually skip the Recaro seats so I can get heated and cooled seats. I’d likely even skip the Performance Package, since 99% of my driving is on the street, not the track. I’d want to test drive one without it before deciding for sure, but for $30,645, I’d have a Mustang with all the features I want, and a lot more car than a $28,190 BRZ Limited for only $2,455 more. But the truth is, with the changes in my life since I bought my BRZ (namely a fiancée with two young boys), I don’t think I could buy either car right now. I’d have to go for something with four doors and a bit of practicality, though I’m not willing to give up the fun, either. It’s too bad neither of these cars has a RWD sports sedan equivalent. I’d most likely be looking at either a Subaru WRX, or a Ford Fiesta or Focus, both in ST trim.